Whether you are a teacher with chalkboards in a classroom or someone who has chalkboards in your home, you need chalkboard cleaning tips to keep your boards looking clean and new. Many of us remember having the job of cleaning the chalkboards, also called blackboards, in our classrooms at the end of the day. After wiping the blackboard clean with the felt eraser, we would go outside to pound the dust out of the erasers by banging two of them together or pounding one against the side of the school wall. Once each week or two, the blackboards would be washed with a sponge and water and left to air dry. Times change and so do methods of cleaning chalkboards. Chalkboards get a lot of use and need routine care and cleaning to remain in good working condition. Accumulation of chalk dust can cause damage to the boards. The following tips will help you to keep your chalkboard like new. When erasing a blackboard start with a clean eraser. Begin in the upper left hand corner and wipe the board in an up and down motion, ending at the upper right corner. Using this motion prevents chalk dust from sticking to the surface of the chalkboard in patterns that are irregular. This motion technique should be used regardless of the cleaning materials being used. 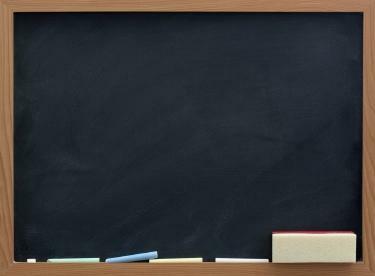 Use an all felt chalkboard eraser to clean the entire blackboard and then wipe the board with a cloth or chamois that is lint free, clean, dry. Clean your blackboard erasers on a daily basis by clapping them, wiping them with warm water or cleaning them with a Dusteze Chalkboard Eraser Vacuum Cleaner. Spray a cloth with a product made for cleaning and dusting, such as Endust. When you wipe the board with the cloth all of the chalk will come off without leaving streaks or uneven spots. There are several different types of cleaning solutions that can be used on a periodic basis or on an as needed basis to clean chalkboards. The LoveToKnow article cleaning solutions for blackboards includes directions on making and using the following cleaning solutions. A cleaning material that will leave your blackboard smooth, clean and free of residue is lemon oil. A popular method of creating a fun chalkboard is using chalkboard paint. This type of paint is available as a paint on or spray on coating. Chalkboard paint can be applied to a small area or an entire wall. To clean a chalkboard paint blackboard use a regular blackboard eraser or damp cloth. With extended use, a chalkboard paint blackboard may not become clean with routine cleaning. A simple solution is to wipe the area with a damp cloth, allow it to dry and simply apply another coating of chalkboard paint. The following are several more useful chalkboard cleaning tips. Remove stubborn stains from a blackboard using water and a mild cleaner that is non-oily and non-abrasive. This mixture removes crayon, pencil and most ink marks and stains made fingerprints. Never write on a chalkboard that is wet. Doing this can cause the chalk to adhere to the board making it extremely difficult, if not impossible, to remove. Water used to clean a chalkboard causes ghosting to occur. This happens when most of the chalk residue is washed away by the water but an outline is left. Layers of ghosting builds up over time making the blackboard difficult to read.